A good decision is the one taken at the right time for the right purpose. Today, with rising electricity expenses, it is necessary to take smart decision and to save electricity wherever possible. One of such smarter way is to switch to never ending source of solar energy. Free of cost and renewable source that is eco friendly and economical. One company that has been helping peoples switch to solar energy easily is SOYO SOLAR. Soyo Solar is new arrival of Soyo Systems. Soyo solar offers a large variety in solar products. Having a system that creates solar energy means you use less electricity from your utility company, and that can contribute to lower heating and cooling costs. Thus you can reduce your monthly electric bills. Depending on where you live, you may also be eligible for incentives through your utility company. The sun has been around for billions of years and is likely to burn on for billions more to come. And when you consider how a trusted name is putting it to economical use in the home, it’s easy to see solar energy’s future is bright. 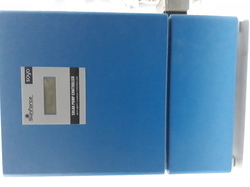 Soyo Solar Pump controller is a combination of -MPPT Charge controller with Variable frequency drive ,with our own design. Its a DSP Controlled Design with all standard MNRE Specification and protections. With Remote Monitoring facility -Additional. The controller is having Boost and Buck modes. It is suitable for 3 phase pumps - 3 phase 220 Volts and 3 Phase -415 Volts. Input Solar Voltage is Ranging from- 160 V DC to 800 V DC. 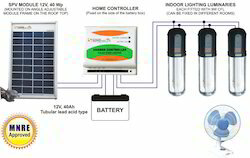 Solar home lighting system (SHL) provides a comfortable level of illumination in one or more rooms of a house. The SHS consists of a PV module, control electronics, battery, and luminary. There are several SHL models featuring one, two, three, or four luminaries based on compact fluorescent lamp (CFL) or light emitting diode (LED). The system could also be used to run a small DC fan or 12V DC television along with the CFL. PV module converts sunlight into electricity, which powers the luminaries which consists of CFL or LED and an electronic circuit. Solar Home Lighting system is specially designed & developed for wall mountable indoor lighting luminary & D.C. fan, which conforms to Ministry of New & Renewable Energy (MNRE) specifications, so as to derive light energy from the sun in day & to Store in Battery for later use. From Battery it is supplied to load(luminary & fan). Highly Efficient Charge Controller Protects Battery from overcharging & deep discharging. High frequency Inverter offers high efficiency, more light output and long service life to the Lamp. Depending of wattage of CFL or LED lamp, D.C. fan & SPV module, ‘SHL’ is available in different four models. Saving in electricity as well as monthly electric bill. Lighting for Homes, Shops, Banks, Clinics, Corridors, etc. We are one of the leading organization engaged in providing excellent quality Solar water Pumps, which are manufactured by using high grade material. We are manufacturing solar water pump controllers ,which can be used to directly drive the existing elctric pump .In this we have used the VFD technology .In day time it works on Solar and in the night we can use it on Electricity. These Solar Pump are widely appreciated by our clients which are situated all round the nation. High in demand, these Solar Pump are available at most reasonable prices. The Solar powered pump is water pumping device, which uses solar energy to pump water from a bore well during the day and offers an option to store water in an over head tank for use as and when required. It is an environmentally friendly technology. Pollution free& gives saving of future needs, that is fuel & electricity. Solar pumps offer a clean and simple alternative to fuel based and electric water pumps for domestic water, livestock & irrigation. They are most effective during dry & sunny seasons. The system is useful to provide piped water supply in remote village where grid power is not available. The Solar powered submersible pump can be installed on a bore well. The pump delivers water directly to an overhead tank for storage and distribution. The submersible pump is operated on electricity generated by the solar array. The stored water can be used when required in absence of power from the solar array. No Operational cost and low maintenance cost. 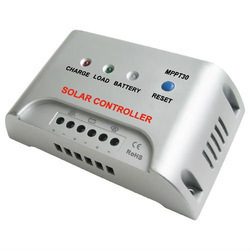 This photovoltaic charge controller is the key component in off-grid or stand-alone solar power generation systems. It can track the maximum power point and transfer energy to various types of batteries. The build-in MPPT microprocessor enables the Solar Charge Controller to increase the energy transfer efficiency by upto 30% compared to traditional charge controllers. Easy installation with parallel connection capability makes Soyo MPPT Solar Charger Controller the perfect solution for your home as well as any large solar system application. This charger calculates the maximum power voltage (V) at which the PV module delivers maximum power, and then the MPPT operates the module at a level, which extracts the maximum available power. The Solar Charger Controller continuously recalculates the maximum power voltage according to the changing operating conditions. Protection against various parameters like over charging current & short circuit, output over voltage, excessive temperature of heat sink, solar/battery reverse polarity, reverse current flow from battery to solar array during night. Looking for SOLAR PRODUCTS ?